In the supply section of Yieldr Ads, you will come across various deal types. This article briefly explains the different types that are currently available. Global deals are deals which are set up without any advertiser restriction whereas private deals are closed for specific advertisers. Deals that you set up for your seat will automatically show up as a private deal. Global deals are deals set up by Yieldr Ads for all of our clients, which are available to you as well. A 'first look' deal gives you a higher priority over buyers in the open auction or in other non-priority deals of the same seller. 'First look' deals usually have a higher CPM compared to non-priority deals. A 'private auction' with Google does not give you 'first look' access. To gain priority, you need to negotiate a 'preferred deal' with Google. A 'preferred deal' will bypass the auction completely as it is closed with a fixed-price CPM on a one-to-one relationship. Audience deals contain specific audiences which are set up by the publisher, e.g. users interested in golf weekends or business travel. Publishers might have pre-defined audiences or will create them for you if the volumes and expected spend are big enough. Also known as channel deals, a publisher may group certain domains of their portfolio in a sub-group, e.g. garden domains, parenting domains, domains for consumer electronics. Please note that content deals are not created based on browsing behavior, to have this included in your deal check for audience deals. High impact formats are formats not part of the IAB standard sizes or the IAB UAP (Universal Ad Package). The IAB defines the UAP formats as 728x90, 300x250, 160x600 and 180x150. So high impact deals could include formats such as the 970x250 ad size or the 1800x1000 ad size. Negotiating a lower floor usually entails a revenue commitment. This means you have to commit yourself to a certain spend with the publisher in order to benefit from a lower floor price. Deals for native ad placements are filed under this category. Yieldr Ads does not support native placement yet. However, we have various tag-based alternatives, please contact your Customer Success Manager for more information. Any Deal with out-of-banner formats such as e.g. 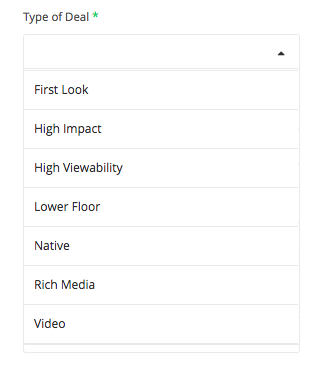 floating, expandable or interstitial formats. If you do not see a deal for the format you would like to run this does not mean it is not possible. In some markets, rich media formats can run in the open auction. For more information please contact your Customer Success Manager. Any Deal with instream or outstream inventory. Instream inventory refers to preroll/midroll/postroll inventory whereas outstream inventory can be a standalone banner such as inarticle/inpage.